You don't expect most 9-year-olds to have much of a nose for business, beyond maybe what they've learned hawking lemonade or cutting neighbors' lawns. Then again, there are always the ones who'll surprise you by revealing a preternatural understanding of cold, hard capitalism and use it to their advantage. One of those kids happens to be a girl named Elina in Canada, who recently set up a cookie stand outside a newly legal weed store, and sold out in a matter of minutes. 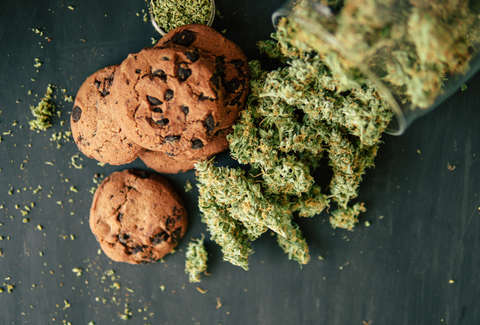 Elina Childs, a 9-year-old Girl Guide (the Canadian version of the Girl Scouts) in Edmonton, Canada took her cookie-selling skills to new heights, when she ditched the door-to-door method in favor of selling boxes of the popular sweet snacks right in front of Nova Cannabis, a weed shop that opened Wednesday after recreational marijuana was officially legalized in the country. She had a full stock of 30 boxes, and sold them all in less than 45 minutes to the crowd outside the store. To be clear, the brilliant plan to sell the cookies in an exceedingly munchies-friendly area was technically originally Elina's dad's idea. However, when he floated it to her, she got very excited about it. "We were looking at it as an opportunity to educate her on what marijuana is and the fact that it's legal in Canada now," her dad told the CBC in an interview. "Everybody was respectful, everybody was happy, and she walked away from it as this incredibly positive experience as well as selling out all her Brownie cookies. She can go and be happy that she'd done that and help support the Guides too." Elina isn't the first young cookie merchant to strategically target a captive crowd of marijuana fans. Earlier this year, a Girl Scout in San Diego pulled off a similar stunt, during which she sold a whopping 300 boxes worth. Elina, kid, you're going places.